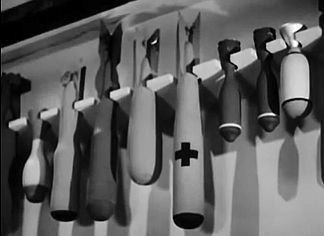 George Melton, an inventor who is developing a secret torpedo to destroy German U-Boats, mysteriously dies while opening a closet door. The plans for this important weapon disappear, and Charlie Chan, who is now working for the U.S. Secret Service in Washington, D.C., is quickly summoned to investigate. Responding to the call, Chan only has time to give a quick "Hello" followed by a "Good-bye" to of a pair his children, son Tommy and daughter Iris, who have come to Washington to visit their father and see the sights. Chan instructs them to wait for him at their hotel while he proceeds to the Melton house. However, the brother and sister decide to follow their father and conduct an investigation of their own. At the house, Chan is greeted by Sargeant Billings, and old friend from Honolulu, and fellow Secret Service agents Jones, another old acquaintance, and Lewis. He is led to a roomful of people whom Melton had invited to a cocktail party prior to his death. Chan begins to question each member of the assembled group: Mrs. Winters, a flighty socialite; her chauffeur, Birmingham Brown; Louis Vega, a war refugee who is now an importer; Inez Aranto and her wheelchair-bound brother Paul Aranto; David Blake, a pompous politician; Melton's housekeeper Mrs. Hargue; and Peter Laska, Vega's valet. It is at this time that Chan's offspring make their noisy entrance, as they run into Birmingham Brown in the dark basement of the Melton house. Agent Lewis finds the plans for a torpedo hidden on the right side of a bookcase. Chan immediately determines that they are a crude forgery and that it is unlikely that Melton had placed them there because he was left-handed. 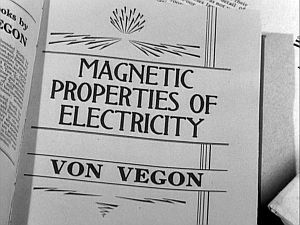 Upstairs, Chan finds a book written by an electrical engineer named von Vegon entitled Magnetic Properties of Electricity. While he is there, Mrs. Hargue brings the detective a knife. As the two talk, a mysterious figure enters the darkened hallway below and removes a painting, revealing a wall safe. Carelessly replacing the painting, the figure disappears into the darkness. Noticing that the painting has been moved, Chan discovers the locked safe. Later, Chan retires outside to speak to the agents in confidence. Birmingham steps behind the nearby bar in the adjacent room to pour himself a drink and notices a reflection of a hand holding a gun that is pointed at Chan. Brown screams, causing the assassin to miss his target and flee. Chan then requests the key to the wall safe from Mrs. Hargue, but finds that none of the keys will open the safe. Proceeding to search Melton's upstairs laboratory, accompanied by Tommy and Birmingham, an assailant turns off the lights. Chan tosses a book at the intruder who then begins to shoot wildly at Chan and the others. Tommy hurls an explosive charge at their attacker, who runs off. As Chan reassembles everyone in the living room, the coroner's report arrives. After examining the report, Chan calls the group into the hallway to demonstrate how Melton was murdered. With Birmingham's help, Chan shows how, as Melton pulled the chain to turn on the light, the killer sent a lethal charge of electricity through it, electrocuting him. Reconvening the group in the living room, Chan accuses Vega of being the celebrated electrical engineer and author von Vegon, whose book he had found earlier upstairs. Chan adds that Vega had killed Melton in order to steal the secret torpedo plans. As Vega begins to respond to Chan's accusations, he collapses in great pain as he is mysteriously shot in the back. After whispering something to Lewis, Chan begins to question everyone about their connection with Vega. When Lewis, following Chan's instructions, roughly confronts Inez, her brother springs from his wheelchair to defend her. Paul then admits that after recovering from injuries suffered in an automobile accident, he remained in his wheelchair in order to test the intentions of his political enemies. Mrs. Hargue finds a key on the piano that Chan uses to successfully open the wall safe. Distracted by his son Tommy, he narrowly avoids being shot by a specially rigged gun that had been placed inside the safe earlier by the mysterious figure. Deducing that von Vegon was killed while a number of persons were standing to his front around the piano, the murder weapon, a noiseless spring-gun had to have been placed on the wall behind the couch where the victim had been seated. Chan concludes that the weapon was fired by means of a powerful electromagnet whose force was focused on the gun which was mounted on the wall. The gun was fired by a switch that was concealed underneath a piano in the same room, and he accuses Peter Laska of pulling the switch as he was afraid that Vega would implicate him in Melton's murder. As the pleading Laska is taken away, and the case is apparently solved, Chan dismisses everyone. Mrs. Winters hurriedly begins to depart to "feed her Pekinese," only to find her way blocked by Laska, who has just reappeared, and then Jones. Explaining that she was seated at the piano, Chan points out that she was the only person who could have reached the switch. Chan accuses her of Vega's murder. Taking a small figure of the Statue of Liberty, which Winters has concealed on her person, Chan smashes it to reveal the missing torpedo plans inside. After thanking Peter for acting as a decoy, Chan concludes that Mrs. Winters, who in reality is master spy Fraulein Manlich, had killed her accomplice Vega, fearing that he was about to confess and then incriminate her. NOTES: This was the first Charlie Chan film that Sidney Toler made at Monogram Pictures after leaving Twentieth Century-Fox following the cancellation of the Charlie Chan film series at that studio. Toler, who had starred as Chan in many of the Fox films, bought the screen rights to the character from the widow of writer Earl Derr Biggers and continued to star as Chan for Monogram until his death in 1947, after which time Roland Winters assumed the role. This film also marked the beginning of Charlie Chan's work with the U.S. Secret Service for the remainder of the war. Mantan Moreland also made his debut as Birmingham Brown, a character who would become a mainstay of the series for the remainder of its run. Benson Fong appeared for the first time as Number Three Son Tommy, while his sister Iris, portrayed by Marianne Quon, made her sole series appearance in Charlie Chan in the Secret Service. Everything grow rapidly in Hawaii. When alibi pushed at me, always suspect motive in woodpile. Detective without curiosity is like glass eye at keyhole - no good. Ninety-nine times out of hundred, right- or left-handed person turn instinctively toward controlling side. Always someone about to stick fly in ointment. Trouble with modern children, they do not smart in right place. Man who never leave wheelchair should never wear out shoe leather. If man places self in way of finger of suspicion, must not be surprised if he receive poke in the eye. Suspicion, like rain, fall upon just and unjust. Murderer always choose weapon he know best. Murder gun staring at us like clock trying to hide face behind hands. 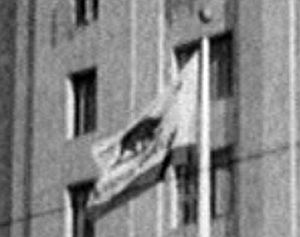 Charlie Chan has moved over to the Monogram lot from 20th-Fox, and the script supplied the veteran detective for his first venture under the new banner is not one of the series' best. Actionless mystery is strictly a program filler. Sidney Toler, who shifted to Monogram along with the Chan stories, tries hard to create interest in Chan's new adventure, but is hampered by halting direction and wordy material. Chan, as a government agent, is assigned to solve mystery surrounding death of an inventor and also to find secret plans stolen from latter. In doing so, he is aided by Gwen Kenyon, Mantan Moreland, Delah Tyler and others in average performance. Majority of sequences take place in home of murdered inventor, thus confining the action and adding to the stodginess of the film. ACCORDING TO GEORGE MELTON, THE DESTRUCTIVE POWER OF THE REAL BOMB IN HIS LABORATORY: "It's more destructive than a blockbuster. If that thing were to drop, everything within a two hundred yard radius would be destroyed - blown to bits." 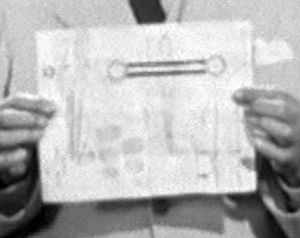 ACCORDING TO AGENT LEWIS, THE DESCRIPTION OF THE ACTUAL BOMB IN MELTON'S LABORATORY: "...the one with the black cross painted on it." 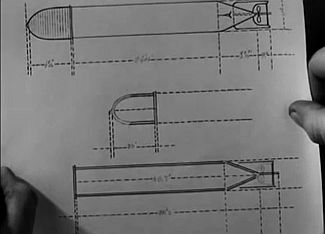 ACCORDING TO GEORGE MELTON, THE LENGTH OF TIME THAT HE HAD BEEN GUARDED BY THE SECRET SERVICE: "...two weeks..."
THE TYPE OF INVENTION THAT GEORGE MELTON WAS WORKING ON: A torpedo that "would utterly destroy the (German) U-boat menace." AGENT JONES' NICKNAME FOR MRS. HARGUE: "The Duchess"
AGENT JONES' DESCRIPTION OF MRS. WINTERS: "The nervous nightmare is Mrs. Winters. She came for cocktails and got hysterics." ACCORDING TO AGENT JONES, LUIS VEGA'S INFORMATION: "War refugee, now a traveling salesman for Harig Brothers Exporters of Smyrna." ACCORDING TO INEZ ARANTO, THE REASON WHY MRS. WINTERS MADE THE STAUETTE FOR HER: "...as a going away gift." ACCORDING TO PAUL ARANTO, THE LENGTH OF TIME THAT PETER LASKA HAD WORKED FOR HIM: "He's been with me for four years." ACCORDING TO CHARLIE CHAN, WHAT THE MORNING PAPER HAD TO SAY ABOUT DAVID BLAKE: "Quote: 'What David Blake does not know about political economy could fill may books,' unquote." THE TITLE OF THE BOOK PULLED FROM THE BOOKCASE BY MRS. WINTERS: "Life Among The Ubangis"
GEORGE MELTON'S BASEBALL NICKNAME: "Portside"
ACCORDING TO JONES, THE NUMBER OF SHOTS RECENTLY FIRED FROM PETER LASKA'S GUN: "Four bullets fired from it recently." 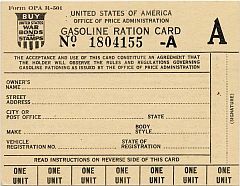 "A" card - The lowest-level gasoline ration card issued by the United States government during World War II. Birmingham Brown: "Every time he looks at me, he makes me feel as futile as a traveling salesman with nothin' but a 'A' card." bats in her hat - (Idiom - as used) Probably referring to a confused state of mind. Iris Chan: "She's got bats in her hat and bees in her bustle." bees in her bustle - (Idiom - as used) Probably referring to being in a state of confusion. black sheep - A member of a family or other group who is considered undesirable or disreputable. Charlie Chan: "Excuse, please, but sputtering firecracker and black sheep are noisiest members of Chan family." blockbuster - A large bomb used to demolish extensive areas (as a city block). George Melton: "It's more destructive than a blockbuster." 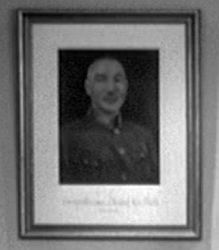 Chiang Kai-shek - 1887–1975, Chinese Nationalist leader. He was also called Chiang Chung-cheng. David Blake: "Mr. Melton asked me to drop by for cocktails." cooking - (Slang) To happen, develop, or take place. DPE (Department of Political Economy) - A fictitious department of the United States federal government. Charlie Chan: "DPE. What does that stand for, please?" dud - (Informal) One who is disappointingly ineffective or unsuccessful. Iris Chan: Are you a detective or a dud?" hepcats - (Slang) Performers or devotees of swing or jazz in the 1940s. Tommy Chan: "...we're hepcats of the younger generation." icky - (Informal) Offensive; distasteful. Tommy Chan: "She's strictly icky." Tommy Chan: "This is what made the Jap fleet not so fleet." Manpower Commission (War Manpower Commission) - In January of 1942, as the United States shifted to a wartime economy, all employment services were federalized by executive order and transferred to the United States War Manpower Commission. 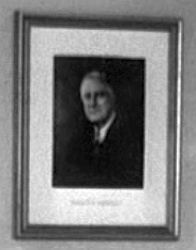 The goal of the War Manpower Commission was to "stabilize" employment and bring about a full utilization of the labor force by "placing a man on a job where he will use his highest skill in furtherance of the war effort, and keeping him there." With the end of the war in 1945, the War Manpower Commission was dissolved. Birmingham Brown: "Hello, is this the Manpower Commission?" Miss Liberty - An informal term for the Statue of Liberty, the famous monumental sculpture that prominantly graces New York Harbor. Charlie Chan: "Miss Liberty - very lovely lady." off the beam - (Idiom) On the wrong track; off course. 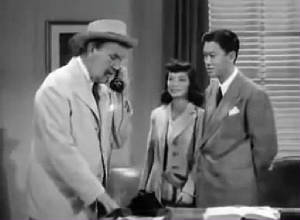 Charlie Chan in the Secret Service - Tommy Chan: Right off the cop and way off the beam." off the cop - (Idiom - as used) Probably a reference to someone being of an unstable mind. Tommy Chan: "Right off the cop and way off the beam." out to sea - (Idiom - as used) Probably meaning that someone is "gone," or out of their mind; crazy. Iris Chan: "He means she's a slick chick gone to sea, Pop." pal - (Informal) A friend; a chum. Secret Service Agent: "Going somewhere, pal?" pekinese - A Chinese breed of small short-legged dogs with a long silky coat and broad flat muzzle. Mrs. Winters: "It's my dog, my pekinese, he has to be fed." phoney detail - An assigned duty that is not genuine or real. Lewis: "...but, you'll have to admit, it's a phoney detail." photoelectric cell - An electronic device having an electrical output that varies in response to incident radiation, especially to visible light. Also called electric eye. Charlie Chan: "Photoelectric cell behind eyes of head." Iris Chan: "He's trying to pin something on us, and it's no bouquet." portside - (Baseball slang) A left-handed ballplayer, most often used in reference to a pitcher. Charlie Chan: "Even Chinese detective know portside ballplayer is left-handed." presidential warrant - A document that gives the bearer special authority. Jones: "Plenty of authority - I carry a presidential warrant." Birmingham Brown: "I better scram out of here before I scram out of my skin!" slick chick - (Slang) Probably a reference to a sneaky woman. 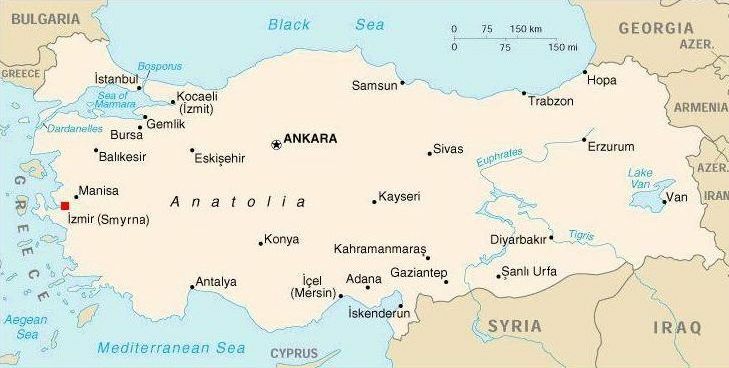 Smyrna - A port city also known as Izmir, in western Turkey. Jones: "War refugee, now a traveling salesman for Harig Brothers Exporters of Smyrna." Ubanghis - Collective name for a group of African tribes living along the Congo River in the former French Congo. Mrs. Winters (reading the title of a book): "Life Among the Ubanghis." U-boat - A submarine of the German navy. Secret Service Chief Inspector: "His newest invention, which the Navy believes would utterly destroy the U-boat menace..."